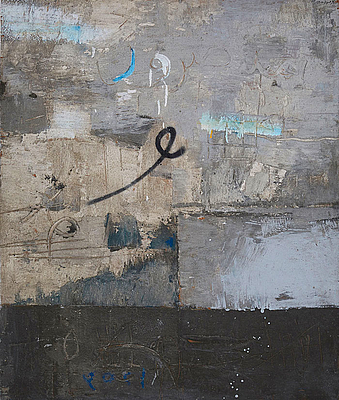 Al-Muntassirun (The Victorious) belongs to a series of mixed media, tactile works where the celebrated Iraqi artist Shakir Hassan Al Said suspends isolated Arabic letters—in this case the waw—against abstracted compositions, suggestive of graffiti written on a concrete wall. In the mid-20th Century, a number of artists in the Arab region began exploring the Arabic letter as a source of inspiration, and Al Said was chief among them. This painting, from a later period, represents the artist’s aesthetic theory and corresponding artists’ group, One Dimension founded in 1971, which explores the spiritual, dimensions of calligraphic representation and contemplates the dimensions of the pictorial surface. Incorporating philosophical sources such as Sufi thought and Deconstruction, Al Said’s approach to art making experimented with repetitive gestures and lacerations of pictorial surfaces as a way to transcend into the realm of the divine, considered the One Dimension.